A sci-fi film so terrible yet so much fun to watch! Despite rumours of UFOs in the area, will anyone believe Nancy? What effect will Nancy’s close encounter have on her? Although Nancy Archer is heir to the Fowler fortune, it is clear that her wealth cannot buy her happiness in life. She has had frequent treatment in sanatoriums for mental issues and alcoholism. Her love for her husband is the only thing that keeps her going but he only stays with her for her money. Her husband, Harry doesn’t even try to hide the fact that he’s having an affair with the ruthless local man-eater, Honey Parker. 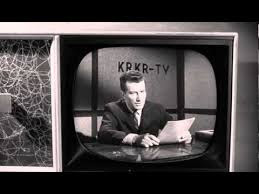 A television announcer from KRKR-TV reports sightings of a red fireball around the world. The announcer then draws our attention to a world globe, on which he traces the cities where sightings were reported and facetiously concludes, "The stranger from space should be over our California desert in a matter of minutes." Meanwhile, the troubled and distraught Nancy Archer is driving her 1958 Chrysler Imperial at night on Route 66 when suddenly a glowing sphere descends, and lands on the road in front of her, causing her to swerve off the road and come to a stop. 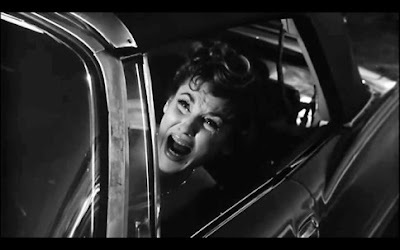 We next see Nancy screaming while trying to start her car. She then gets out only to be menaced by a huge hand belonging to the gigantic occupant of the sphere. Nancy screams and clutches a large diamond pendant around her neck and finally manages to escape by running down the road. Back at Tony's Bar and Grill, we see Nancy's philandering husband, Harry with his girlfriend, Honey Parker. Harry tells Honey that he returned to his wife as he needed the cash, seeing that Nancy is worth about $50 million. According to Honey’s way of thinking, in matters concerning community property, a man like Harry " hasn't got a chance…. unless the wife dies," Harry, however, is thinking more in terms of recommitting Nancy to a mental institution. Two fine examples of how people can view fellow human beings merely as a source of personal gain and advancement. We all too often see this kind of attitude and behaviour manifesting itself in politics, business, personal relationships, within families, in the workplace and so on. 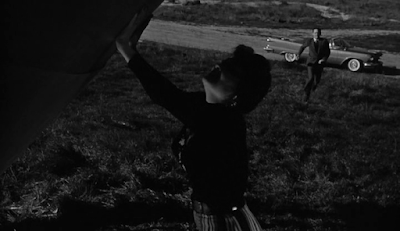 Later, Nancy suddenly runs into the parking lot after her escape from the giant appendage! Amid the commotion, Sheriff Dubbitt manages to clear the crowd and sends his deputy, Charlie to find Harry. When Nancy tries to explain what happened, all she gets is condescension from the local authorities with the general consensus being that she’s either drunk or crazy. Nancy responds with anger, "…. You think I'm drunk, don't you?" She then pleads, "You've got to believe me! It was right in the middle of the highway, thirty feet tall! It lit up the sky! You don't believe me, do you?" As Nancy finds out, people are more inclined to judge others based on superficial perceptions as well as on preconceived and prejudiced notions about what they are supposedly like. In the meantime, Charlie has located Harry and Honey smooching in a booth. When he reluctantly interrupts the couple, he is given some money from Harry who suggests to him, "You couldn't find me tonight, Charlie. I took a cab home." The sheriff, deputy Charlie and Nancy then drive off to search for evidence of the giant and the satellite. It is decided to go to the desert to conduct a search but only because Nancy is rich and pays most of the town’s taxes! At the scene of the sighting, however, all they find is Nancy’s car and after a brief search they find nothing else. An angry Nancy then gets in her car and drives off in frustration. Nancy Archer: My husband!... My gigolo! That's what you are. You're a miserable parasite! You're just after my money! I was rid of you once. Why did I take you back? Why? Why? Harry Archer: Why did you, Nancy? Nancy Archer: Why?... because I love you, Harry! Soon after Nancy arrives home, she discovers Harry laying on the couch. They then argue about his philandering ways and her alcoholism. Nancy even goes so far as to blame herself for his behaviour and admits that she needs him, loves him and wants their marriage to work. Nancy then tells him of her encounter with the satellite and the giant. Harry finally puts her to bed, gives her a sedative, pockets her diamond pendant, and then heads back to Tony's Bar to see his bit of skirt, Honey Parker. At Tony's Bar and Grill, Deputy Charlie is having a whale of a time showing off his dance moves with Honey but beats it when Harry arrives. Harry is annoyed that Honey wasn't at the hotel, but Honey is even more annoyed and snaps at Harry, calling the hotel room a "fleabag” and declaring that she’s “tired of waiting." Harry then tells Honey that his wife is cracking up and he shows her the Star of India diamond, in the hope that she’ll be patient. What a match made in heaven! An unprincipled dissolute excuse for a man and an immoral gold-digging floozy who’ll only stick around as long as glittering baubles are dangled before her eyes. Some people in life really deserve each other! Imagine Nancy’s hurt and humiliation at discovering that her personal predicament has become fodder for the public who are led to believe that she is suffering from delusions brought on by alcohol. Once it was mainly the rich and famous that were the subject of tabloid gossip, innuendo and salacious revelations about their personal lives, none of which needed to be true! These days any of us can be subject to this public death by a thousand cuts thanks to the advent of social media – that great democratization of freedom of speech! Now anyone can have their dirty linen paraded for all to see. Any of us can be trolled, bullied, threatened, admonished into submission. And when we allow this kind of abuse of freedom to get at us and damage our reputations, then we’ve lost something of our own personal freedom – we in fact become “owned” by fools and cowards exercising freedom without responsibility. So much said by so many with little meaningful to say…..
All Nancy can do after seeing the report is pitch the bottle at the TV. She then decides on a course of action by convincing Harry to accompany her into the desert to search for the "flying satellite," agreeing to voluntarily return to the sanatorium if they fail to find any evidence. As night falls, after hours of driving and searching, they eventually locate the spacecraft. Nancy runs up to it and presses her hands against it, exclaiming, "It's real! It's real! I'm not crazy! I did see it!" Suddenly an enormous male humanoid, emerges and reaches out to her. Harry fires his revolver at it, but without any effect. Harry like the cad and bounder he is decamps the scene, leaving Nancy behind. As soon as Harry arrives at the house, he dashes past loyal butler, Jess and frantically begins packing his suitcase. Jess demands, "what have you done with Mrs. Archer?" but Harry just ignores him and continues to pack. A fight ensues between the two men with Harry getting the better of Jess. Harry then grabs his suitcase and departs with alacrity. At the hotel room, Harry dashes in and tells Honey to "get dressed and packed, quick." However, before they can leave, they are confronted by Deputy Charlie and the night clerk. Charlie is not playing the lovable bribe-taking lovable fool this time! Instead, he takes the pair of villainous scoundrels to see the sheriff. While Charlie, Harry and Honey wait at the sheriff’s office, the sheriff and a posse are searching for Nancy. A phone call informs the three at the Sheriff’s office that Nancy was discovered on the roof of her pool house at the Archer estate. The three then drive back to the house. At the house, family physician Dr. Cushing sedates Nancy as she is delirious. Later, Dr. Cushing tells Sheriff Dubbitt that she should be moved to a hospital when she's well enough. He is very concerned about the scratches on her throat and theorizes that she may have been exposed to and contaminated by radiation. Harry lies to the Sheriff by telling him that he was with Honey all evening. His story is corroborated by Honey. 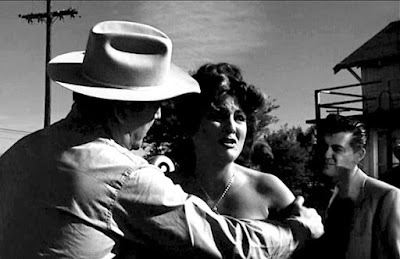 The sheriff warns Harry and Honey not to leave town. As they drive back to town, evil woman Honey begins working on Harry by telling him, "I heard the doctor tell (the nurse) that an overdose would be fatal." Harry replies somewhat light-heartedly and sarcastically, "Money certainly brings out the best in you, doesn't it?" Honey then probes further by asking him, "Have you got the nerve?" Harry, the lady is serious! “Bad” or evil women in films make the most interesting characters. This is so especially when they use their intelligence, cunning, wits and feminine attributes to manipulate a situation to their own advantage. It is often the overconfident male characters who unwittingly find themselves being manipulated. Who wants to see a typical 21st century politically correct female character who is nothing more than a male replacement action hero which has been dreamt up by mostly male writers or producers as some kind of on-screen fantasy? How much better to see a self-assured female character who can negotiate her way through a situation and take command via a look, a word or a gesture. THAT is more interesting than a phoney equal opportunity sock to the jaw from a woman merely behaving just like a man! The answer to Honey’s previous question reveals itself when we see Harry filling the syringe and stealthily making his way upstairs to the bedroom. Just as he approaches the sleeping Nancy, the nurse snaps on the light. Suddenly the nurse screams and calls for the doctor while Harry reacts in horror when a giant hand descends toward him. "Doctor Cushing, something's happened to Mrs. Archer," the nurse screams again. Dr Cushing has called in his specialist colleague, Dr. Heinrich Von Loeb, but both appear to be unsure as to how to treat their patient. A delivery of meat hooks, lengths of chain and medical supplies is made to the Archer residence in accordance with Cushing’s and Von Loeb’s decision to keep their patient in a coma with morphine and to restrain her with chains until the authorities arrive to help. Deputy Charlie: Wow! What is that? Sheriff Dubbitt: I don't know. Whatever it is, it wasn't made by some Japanese gardener. The sheriff and deputy Charlie conduct a search around the pool house area. Suddenly, Sheriff Dubbitt notices a giant footprint in the garden while Charlie spots some more prints. The Sheriff then sends Charlie back to the office for weapons. Sheriff Dubbitt and Jess track the enormous footprints that are leading away from the estate and out into the desert. They soon come across the satellite and cautiously approach it. Sheriff Dubbitt believes that the giant brought Mrs. Archer to her home and placed her on the roof of the pool house. The finding of a gun seems to confirm that the Archer couple had been there. Sheriff Dubbitt and Jess very cautiously enter the opening into the satellite. Once inside the sphere, they spot Nancy's diamond necklace together with other large gemstones, each one contained in a clear glass sphere. This leads the two men to conclude that the jewels are being used as a power source for the sphere. Suddenly, the huge alien appears, and the two men decide to beat a hasty retreat. Of course, the car chooses that moment to roll over and play dead, so the two men abandon it just as the giant diaphanous alien lumbers over and overturns the car. After being pelted with bullets and grenades, all to no effect, the giant re-enters the sphere and takes off for parts unknown. Sheriff Dubbitt and Jess now face a long trudge back to town. In the meantime, the sedative has not worked, and Nancy has awoken from her coma with more than just a giant headache. She calls out for Harry and as Cushing and Von Loeb try to administer more morphine, Nancy (with the rest of her body having achieved gigantic proportions) breaks free of the restraints. It’s as if symbolically, Nancy has become a product of the kind of callous indifference and disregard of her as a person as displayed towards her by the likes of her husband and many others in society. Her reaction is to literally try to break free of the bonds holding her down and lash out violently, seek revenge and demolish the established order of the little world around her which she has now outgrown. Dr. Isaac Cushing: She will tear up the whole town until she finds Harry. Deputy Charlie: And then she'll tear up Harry. Nancy proceeds to rip off the roof of her mansion before making her way to town, to exact revenge on her unfaithful husband. She declares, "I know where my husband is. He's with that woman. I'll find him." When she gets to town, she rips the roof off the bar and spots Honey. Nancy causes a beam to fall from the ceiling and come crashing down on Honey, killing her. Nancy now focusses her attention on Harry, who has been ineffectually blasting away at her with a gun. She reaches down, picks him up and carries him up through the open roof. Harry cries out, "You're crushing me. I can't breathe." Sheriff Dubbitt opens fire at Nancy Archer but with no effect. He then carefully takes aim and fires at a transformer causing it to explode, thereby electrocuting Nancy along with Harry. Both are now lying dead on the ground with Nancy clutching Harry in her hand. And finally, as ironically stated by the doctor, "She finally got Harry all to herself." 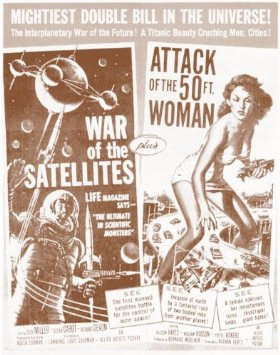 Attack of the 50 Foot Woman was distributed in the US by Allied Artists on a double bill with War of the Satellites. 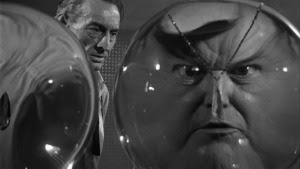 The film capitalized on the popularity of previous 1950s science fiction films that featured size-changing humans such as The Amazing Colossal Man, its sequel War of the Colossal Beast, and The Incredible Shrinking Man. This time it was decided to have a female as the main protagonist. The movie was shot in just eight days for only $89,000 - $10,000 under budget. The alien spacecraft is called a "satellite" in the film most likely due to the then recent launching of the spherically-shaped Russian “sputnik” satellite. The poster for this movie was designed by Roger Corman and is in the Museum of Modern Art's permanent collection. The movie's poster was listed as #8 of "The 25 Best Movie Posters Ever" by Premiere magazine. 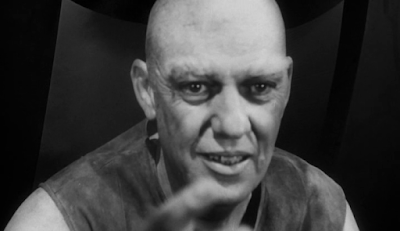 The giant bald space alien is played by Michael Ross who also played the bartender. Allison Hayes who played Nancy, died at the age of 46 due to lead poisoning from calcium pills she had been taking. 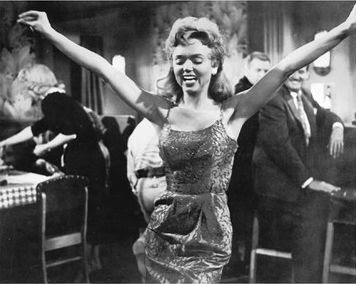 Yvette Vickers who played Honey was tragically discovered alone in her home in 2011. Her mummified body lay undiscovered for over a year. It was determined that she had died of natural causes at the age of 82. There was a plan to do a bigger-budget sequel shot in CinemaScope and colour, but the film never went into production. Continuity and special effects are definitely not a strong point of this film. For instance, in the giant alien’s sphere, why are various items scaled to the sheriff and Jess’ size? Then there’s superimposed images of the giant alien and Alison, both of whom we can easily see right through! I won’t even bother to go into the giant floppy flaccid foam rubber hand that seems to be afflicted with some kind of skin disease! 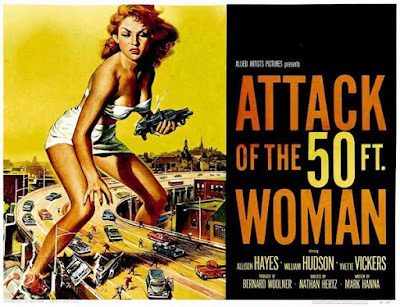 Attack of the 50 Foot Woman began with an interesting idea involving Nancy, the wealthy heiress; her no-good husband, Harry and the “other woman”, Honey the hussy. Unfortunately, as it progressed towards the final climax, the story just continued to unravel. 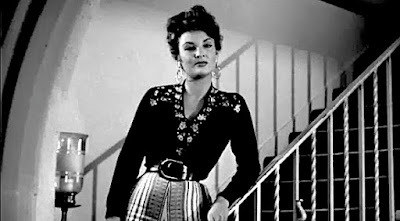 Nevertheless, Allison Hayes did display some acting talent and screen presence, despite not having much to work with. William Hudson was well cast as Nancy’s cheating and unprincipled husband as was Yvette Vickers as Harry's conniving mistress. 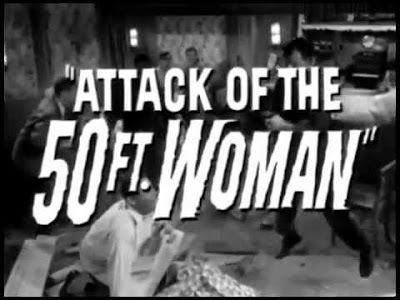 Attack of the 50 Foot Woman: A small gem from the 1950s whose big shoes have yet to be filled!